As Dr. John Wells joined the other members of Virginia’s revitalized climate change commission for its inaugural meeting on September 10, Hampton Roads residents were still drying out from heavy rains that had swamped coastal areas where rising seas and sinking land leave few places for water to drain. Wells, Dean and Director of the Virginia Institute of Marine Science, was named to the Climate Change and Resiliency Update Commission by Governor Terry McAuliffe in July. The Governor has given the commission—a bipartisan group made up of 41 leaders from around the state—one year to complete its work. “We need to prepare Virginia’s coastal communities to deal with the growing threat of climate change, which is why I’ve re-convened the Climate Commission for the first time in four years,” said Governor McAuliffe. The commission was originally convened by then-Governor Tim Kaine in 2007, and issued its first report in December 2008. Wells says his main role on the commission will be to help provide concrete and prioritized recommendations for how Virginia can best respond to sea-level rise, the most immediate climate-change issue facing the Commonwealth. VIMS’ expertise and data are indeed already helping to guide the Commonwealth’s emerging response to sea-level rise and coastal flooding. Professor Roger Mann was a member of Governor Kaine’s original Climate Change Commission, and VIMS’ 2012 report to the General Assembly on recurrent coastal flooding provides the framework for several sections of the Secure Commonwealth Panel’s recent report on the same topic. 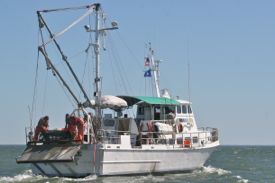 The Virginia Coastal Policy Clinic—a partnership between the William & Mary Law School, VIMS’ Center for Coastal Resources Management, and Virginia Sea Grant—also draws heavily on the 2012 report, using its findings as a scientific baseline for identifying and resolving the legal ramifications of rising seas. “Review of the Kaine commission’s 2008 report provides a great springboard for our deliberations,” says Wells. “It gives the first assessment of climate-change impacts in Virginia, and a broad list of recommendations for how to respond. Our goal now is to distill those recommendations into five or six concrete strategies for mitigating climate change and adapting to its effects.” Governor McAuliffe has also tasked the commission with identifying sources of funding so that the recommendations can be fully implemented. Wells believes the focus of the commission’s recommendations will be on adaptation, as greenhouse gases have already reached atmospheric levels that all but guarantee significant climate-change impacts. Mr. Jim Redick—lead author of the Secure Commonwealth Panel’s recent report on recurrent coastal flooding—notes that the document draws significantly from the recommendations in VIMS’ 2012 report to the General Assembly. The panel—an advisory board to Virginia’s Governor—approaches climate change from the perspective of emergency management and response. Responses to flooding and sea level rise are also already in play, says Wells. During the Commission’s inaugural meeting, he and the other commissioners heard from David Paylor—director of Virginia’s Department of Environmental Quality—who described some of the concrete actions that grew out of the recommendations put forth by the Kaine Commission in 2008. Paylor’s remarks focused on advances in the management of Virginia’s wetlands, beaches, and dunes. 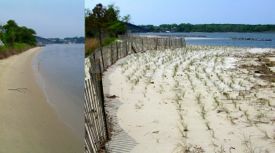 “This ‘natural infrastructure’ protects against storms,” said Paylor, “and is a key component in coastal resiliency.” He described how funding from Virginia’s Coastal Zone Management program has helped VIMS scientists create shoreline inventories, develop shoreline-evolution reports, and promote living shorelines. “These products have given us a base from which to plan for rising sea levels and increasing and intensifying storms,” said Paylor. “What’s key from a climate adaptation perspective is that living shorelines can sometimes allow marshes to migrate inland whereas bulkheads and rock revetments do not.” Wetlands also absorb wave energy, helping reduce shoreline erosion and damage to coastal property. The second meeting of Governor McAuliffe’s Climate Change Commission is scheduled for December 5 in Williamsburg, in conjunction with the latest in a series of workshops organized by the Virginia Coastal Policy Clinic. Workshop participants will focus on recent changes to the National Flood Insurance Program's Community Rating System, questions of social vulnerability in Hampton Roads, the role of market forces and the private sector in driving adaptation, and strategies for promoting regional collaboration.